Last modified on September 14th, 2018. The 'Radar Diagram' is not composed of special diagram constructs. 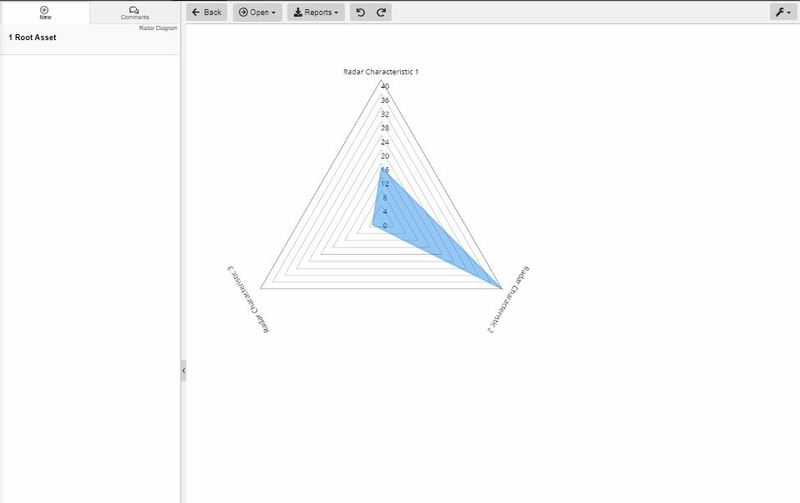 In fact, a 'Radar Diagram' can be generated by Innoslate on the fly based on the current contents of your project’s database, as long as the root asset contains relationships with more than 2 Characteristics. The 'Radar Diagram' is built using entities in the database of the 'Asset' and 'Characteristic' class. The entities display as radar vector shapes. The ‘Radar Diagram’ is not composed of special diagram constructs. In fact, a ‘Radar Diagram’ can be generated by Innoslate on the fly based on the current contents of your project’s database, as long as the root asset contains relationships with more than 2 Characteristics. The ‘Radar Diagram’ is built using entities in the database of the ‘Asset’ and ‘Characteristic’ class. The entities display as radar vector shapes.